Born c. 570 CE in Mecca, Muhammad was raised by his uncle Abu Talib and later worked as a merchant. Muhammad was born in or around the year 570 CE to the Banu Hashim clan of the Quraysh tribe, one of Mecca ‘s prominent families. Muhammad was orphaned at an early age and brought up under the care of his paternal uncle Abu Talib. Muhammad worked mostly as a merchant, as well as a shepherd, and married Khadijah, a 40-year-old widow, in 595 CE when he was twenty-five. In 605 CE, Muhammad honored all the Meccan clan leaders and set the Black Stone back into the correct spot in the Ka’aba. the Black Stone: The eastern cornerstone of the Kaaba, the ancient stone building located in the center of the Grand Mosque in Mecca, Saudi Arabia. It is revered by Muslims as an Islamic relic that, according to Muslim tradition, dates back to the time of Adam and Eve. Quraysh tribe: A powerful merchant group that controlled Mecca and the Kaaba. Muhammad unified Arabia into a single religious polity under Islam. Muslims and Bahá’ís believe he is a messenger and prophet of God. The Quran, the central religious text in Islam, alludes to Muhammad’s life. Muhammad’s life is traditionally defined into two periods: pre-hijra (emigration) in Mecca (from 570 to 622 CE) and post-hijra in Medina (from 622 until 632 CE). There are also traditional Muslim biographies of Muhammad (the sira literature), which provide additional information about Muhammad’s life. Muhammad is almost universally considered by Muslims as the last prophet sent by God to mankind. While non-Muslims regard Muhammad as the founder of Islam, Muslims consider him to have restored the unaltered original monotheistic faith of Adam, Noah, Abraham, Moses, Jesus, and other prophets. Muhammad was born around the year 570 CE to the Banu Hashim clan of the Quraysh tribe, one of Mecca’s prominent families. His father, Abdullah, died almost six months before Muhammad was born. According to Islamic tradition, Muhammad was sent to live with a Bedouin family in the desert, as desert life was considered healthier for infants. Muhammad stayed with his foster mother, Halimah bint Abi Dhuayb, and her husband until he was two years old. At the age of six, Muhammad lost his biological mother, Amina, to illness and was raised by his paternal grandfather, Abd al-Muttalib, until he died when Muhammad was eight. He then came under the care of his uncle Abu Talib, the new leader of Banu Hashim. Muhammad worked as a trader for Khadija, a widow, until he married her in 595 CE at the age of 25. The marriage lasted for 25 years and was reported to be a happy one. Muhammad relied upon Khadija and did not enter into a marriage with another woman during his first marriage. After Khadija’s death, Khawla bint Hakim suggested that Muhammad that should marry Sawda bint Zama, a Muslim widow, or Aisha, daughter of Um Ruman and Abu Bakr of Mecca. Muhammad is said to have asked for arrangements to marry both. According to a text collected by historian Ibn Ishaq, Muhammad was involved with a well-known story about setting the Black Stone in place in the wall of the Kaaba in 605 CE. The Black Stone, a sacred object, had been removed to facilitate renovations to the Kaaba. The leaders of Mecca could not agree on which clan should have the honor of setting the Black Stone back in its place. They agreed to wait for the next man to come through the gate and ask him to choose. That man was the 35-year-old Muhammad, five years before his first revelation. He asked for a cloth and put the Black Stone in its center. The clan leaders held the corners of the cloth and together carried the Black Stone to the right spot; then Muhammad set the stone in place, satisfying all who were present. Muhammad and the Black Stone: An illustration from c. 1315 depicting Muhammad’s role in re-setting the Black Stone in 605 CE. Occasionally he would retreat to a cave in the mountains for several nights of seclusion and prayer; it is reported that it was at this spot that he was visited by Gabriel and received his first revelation from God. Muhammad received revelations from 609-632 CE, and they became the basis for the Quran, the central religious text of Islam. Muhammad first received revelations in 609 CE in a cave on Mount Hira, near Mecca. Muslims regard the Quran as the most important miracle of Muhammad, the proof of his prophethood, and the culmination of a series of divine messages revealed by the angel Gabriel from 609–632 CE. The key themes of the early Quranic verses included the responsibility of man towards his creator; the resurrection of the dead, God’s final judgment followed by vivid descriptions of the tortures in Hell and pleasures in Paradise; and the signs of God in all aspects of life. Religious duties included belief in God, asking for forgiveness of sins, offering frequent prayers, assisting others particularly those in need, rejecting cheating and the love of wealth, being chaste, and not killing newborn girls. Muhammad’s immediate family were the first to believe he was a prophet, followed by three main groups of early converts to Islam: younger brothers and sons of great merchants, people who had fallen out of the first rank in their tribe or failed to attain it, and unprotected foreigners. Muslims believe the Quran to be both the unaltered and the final revelation of God. Religious concepts and practices include the five pillars of Islam, which are obligatory acts of worship, and following Islamic law, which touches on virtually every aspect of life and society, from banking and welfare to the status of women and the environment. Quran: Literally meaning “the recitation,” it is the central religious text of Islam, which Muslims believe to be a revelation from God. Khadijah: The first wife of Muhammad. Five Pillars of Islam: Five basic acts in Islam, considered mandatory by believers and are the foundation of Muslim life. When he was nearly 40, Muhammad began spending many hours alone in prayer and speculating over the aspects of creation. He was concerned with the “ignorance of divine guidance” (Jahiliyyah), social unrest, injustice, widespread discrimination (particularly against women), fighting among tribes, and abuse of tribal authorities prevalent in pre-Islamic Arabia. The moral degeneration of his fellow people, and his own quest for a true religion, further lent fuel to this, with the result that he began to withdraw periodically to a cave called Mount Hira, three miles north of Mecca, for contemplation and reflection. During this period Muhammad began to have dreams replete with spiritual significance that were fulfilled according to their true import; this was the commencement of his divine revelation. Islamic tradition holds that during one of his visits to Mount Hira in the year 609 CE, the angel Gabriel appeared to him and commanded Muhammad to recite verses that would later be included in the Quran. Upon receiving his first revelations, Muhammad was deeply distressed. When he returned home, he was consoled and reassured by Khadijah and her Christian cousin. Muhammad feared that others would dismiss his claims as evidence of him being possessed. On the other hand, Shi’a tradition maintains that Muhammad was neither surprised nor frightened at the appearance of Gabriel, but rather welcomed him as if he was expected. The cave Hira: The cave Hira in the mountain Jabal al-Nour where, according to Muslim belief, Muhammad received his first revelation from the angel Gabriel. The initial revelation was followed by a pause of three years (a period known as fatra) during which Muhammad felt depressed and further gave himself to prayers and spiritual practices. When the revelations resumed, he was reassured and began preaching. Muhammad’s first revelation, according to the Quran, was accompanied by a vision. The agent of revelation is mentioned as the “one mighty in power,” the one who “grew clear to view when he was on the uppermost horizon. Then he drew nigh and came down till he was (distant) two bows’ length or even nearer.” The Islamic studies scholar Welch states in the Encyclopaedia of Islam that he believes the graphic descriptions of Muhammad’s condition at these moments may be regarded as genuine, because he was severely disturbed after these revelations. According to Welch, these seizures would have been seen by those around him as evidence for the superhuman origin of Muhammad’s inspirations. However, Muhammad’s critics accused him of being a possessed man, a soothsayer or a magician, since his experiences were similar to those claimed by such figures well known in ancient Arabia. Welch additionally states that it remains uncertain whether these experiences occurred before or after Muhammad’s initial claim of prophethood. The Quran describes Muhammad as “ummi,” which is traditionally interpreted as “illiterate,” but the meaning is more complex. Medieval commentators such as Al-Tabari maintained that the term induced two meanings: firstly, the inability to read or write in general, and secondly, the inexperience or ignorance of books or scriptures. However, priority was given to the first meaning. Muhammad’s illiteracy was taken as a sign of the genuineness of his prophethood. For example, according to Fakhr al-Din al-Razi, if Muhammad had mastered writing and reading he possibly would have been suspected of having studied the books of the ancestors. Some scholars such as Watt prefer the second meaning. According to the Quran, one of the main roles of Muhammad is to warn the unbelievers of their punishment at the end of the world. The Quran does not explicitly refer to Judgment Day, but provided examples from the history of extinct communities and warns Muhammad’s contemporaries of similar calamities. Muhammad did not only warn those who rejected God’s revelation, but also dispensed good news for those who abandoned evil, listening to the divine words and serving God. Muhammad’s mission also involves preaching monotheism; the Quran commands Muhammad to proclaim and praise the name of his Lord and instructs him not to worship idols or associate other deities with God. The key themes of the early Quranic verses included the responsibility of man towards his creator; the resurrection of the dead, God’s final judgment followed by vivid descriptions of the tortures in Hell and pleasures in Paradise; and the signs of God in all aspects of life. Religious duties required of the believers at this time were few: belief in God, asking for forgiveness of sins, offering frequent prayers, assisting others, particularly those in need, rejecting cheating and the love of wealth (considered to be significant in the commercial life of Mecca), being chaste, and not killing newborn girls. According to Muslim tradition, Muhammad’s wife Khadija was the first to believe he was a prophet. She was followed by Muhammad’s ten-year-old cousin Ali ibn Abi Talib, close friend Abu Bakr, and adopted son Zaid. Around 613, Muhammad began to preach to the public. Most Meccans ignored and mocked him, but he did begin to gain followers. There were three main groups of early converts to Islam: younger brothers and sons of great merchants; people who had fallen out of the first rank in their tribe or failed to attain it; and the weak, mostly unprotected foreigners. 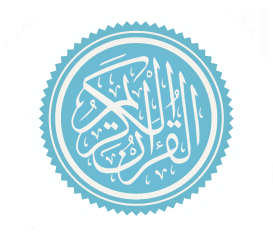 Islam is a monotheistic and Abrahamic religion articulated by the Quran, which is considered by its adherents to be the verbatim word of God (Allah), and, for the vast majority of adherents, by the teachings and normative example (called the sunnah, composed of accounts called hadith) of Muhammad. An adherent of Islam is called a Muslim. Muslims believe that God is one and incomparable and that the purpose of existence is to worship God. Nearly all Muslims consider Muhammad to be the last prophet of God. Muslims also believe that Islam is the complete and universal version of a primordial faith that was revealed many times before through prophets including Adam, Noah, Abraham, Moses, and Jesus. Muslims believe the Quran to be both the unaltered and the final revelation of God. Religious concepts and practices include the Five Pillars of Islam and following Islamic law, which touches on virtually every aspect of life and society, from banking and welfare to the status of women and the environment. Salat (prayer): consists of five daily prayers, the names referring to the prayer times: Fajr (dawn), Dhuhr (noon), ʿAṣr (afternoon), Maghrib (evening), and ʿIshāʾ (night). All of these prayers are recited while facing in the direction of the Kaaba in Mecca, and are accompanied by a series of set positions including bowing with hands on knees, standing, prostrating, and sitting in a special position. Zakāt (charity): the practice of charitable giving based on accumulated wealth. It is the personal responsibility of each Muslim to ease the economic hardship of others and to strive towards eliminating inequality. Zakāt consists of spending a portion of one’s wealth for the benefit of the poor or needy, like debtors or travelers. Sawm (fasting): three types of fasting are recognized by the Quran: ritual fasting, fasting as compensation for repentance, and ascetic fasting. Ritual fasting is an obligatory act during the month of Ramadan. The fast is meant to allow Muslims to seek nearness to and look for forgiveness from God, to express their gratitude to and dependence on him, to atone for their past sins, and to remind them of the needy. Hajj (pilgrimage to Mecca): every able-bodied Muslim is obliged to make the pilgrimage to Mecca at least once in his or her life. The main rituals of the Hajj include walking seven times around the Kaaba, termed Tawaf; touching the Black Stone, termed Istilam; traveling seven times between Mount Safa and Mount Marwah, termed Sa’yee; and symbolically stoning the Devil in Mina, termed Ramee. As Islam faced more political and religious opposition in Mecca, Muhammad and his followers migrated to Medina in 622 CE. As Islam spread in Mecca, the ruling tribes began to oppose Muhammad ‘s preaching and his condemnation of idolatry. The Quraysh tribe controlled the Kaaba and drew their religious and political power from its polytheistic shrines, so they began to persecute the Muslims and many of Muhammad’s followers became martyrs. When Muhammad’s wife Khadijah and uncle Abu Talib both died in 619 CE, Abu Lahab assumed leadership of the Banu Hashim clan and withdrew the clan’s protection from Muhammad. In 622 CE, Muhammad and his followers migrated to Yathrib in the Hijra to escape persecution, renaming the city Medina in honor of the prophet. Among the first things Muhammad did to ease the longstanding grievances among the tribes of Medina was draft a document known as the Constitution of Medina. Mecca: The birthplace of Muhammad and the site of Muhammad’s first revelation of the Quran, this city is regarded as the holiest city in the religion of Islam. Banu Hashim clan: One of Mecca’s prominent families and part of the Quraysh tribe. Medina: Muhammad’s destination during the Hijra, which became the power base of Islam in its first century (renamed from Yathrib). Hijra: The migration or journey of the Islamic prophet Muhammad and his followers from Mecca to Medina in June 622 CE. During the first three years of his ministry, Muhammad preached Islam privately, mainly among his near relatives and close acquaintances. According to Muslim tradition, Muhammad’s wife Khadija was the first to believe he was a prophet. She was followed by Muhammad’s ten-year-old cousin Ali ibn Abi Talib, close friend Abu Bakr, and adopted son Zaid. According to Islamic belief, in the fourth year of Muhammad’s prophethood, around 613, he was ordered by God to make his propagation of this monotheistic faith public. Muhammad’s earliest teachings were marked by his insistence on the oneness of God, the denunciation of polytheism, belief in the last judgment and its recompense, and social and economic justice. Most Meccans ignored and mocked him, though a few became his followers. There were three main groups of early converts to Islam: younger brothers and sons of great merchants; people who had fallen out of the first rank in their tribe or failed to attain it; and the weak, mostly unprotected foreigners. According to Ibn Sad, one of Muhammad’s companions, the opposition in Mecca started when Muhammad delivered verses that condemned idol worship and polytheism. However, the Quran maintains that it began when Muhammad started public preaching. As Islam spread, Muhammad threatened the local tribes and Meccan rulers because their wealth depended on the Kaaba. Muhammad’s preaching was particularly offensive to his own Quraysh tribe because they guarded the Kaaba and drew their political and religious power from its polytheistic shrines. The ruling tribes of Mecca perceived Muhammad as a danger that might cause tensions similar to the rivalry of Judaism and Bedouin Polytheism in Yathrib. The powerful merchants in Mecca attempted to convince Muhammad to abandon his preaching by offering him admission into the inner circle of merchants and an advantageous marriage. However, Muhammad turned down both offers. The last ayah from the sura An-Najm in the Quran: Muhammad’s message of monotheism challenged the traditional social order in Mecca. The Quraysh tribe controlled the Kaaba and drew their religious and political power from its polytheistic shrines, so they began to persecute the Muslims and many of Muhammad’s followers became martyrs. At first, the opposition was confined to ridicule and sarcasm, but later morphed into active persecution that forced a section of new converts to migrate to neighboring Abyssinia (present day Ethiopia). Upset by the rate at which Muhammad was gaining new followers, the Quraysh proposed adopting a common form of worship, which was denounced by the Quran. Muhammad himself was protected from physical harm as long as he belonged to the Banu Hashim clan, but his followers were not so lucky. Sumayyah bint Khabbab, a slave of the prominent Meccan leader Abu Jahl, is famous as the first martyr of Islam; her master killed her with a spear when she refused to give up her faith. Bilal, another Muslim slave, was tortured by Umayyah ibn Khalaf, who placed more and more rocks on his chest to force his conversion, until he died. Muhammad’s wife Khadijah and uncle Abu Talib both died in 619 CE, the year that became known as the “year of sorrow.” With the death of Abu Talib, Abu Lahab assumed leadership of the Banu Hashim clan. Soon after, Abu Lahab withdrew the clan’s protection from Muhammad, endangering him and his followers. Muhammad took this opportunity to look for a new home for himself and his followers. After several unsuccessful negotiations, he found hope with some men from Yathrib (later called Medina). The Arab population of Yathrib were familiar with monotheism and were prepared for the appearance of a prophet because a Jewish community existed there as well. They also hoped, by the means of Muhammad and the new faith, to gain supremacy over Mecca; the Yathrib were jealous of its importance as the place of pilgrimage. Converts to Islam came from nearly all Arab tribes in Medina; by June of the subsequent year, seventy-five Muslims came to Mecca for pilgrimage and to meet Muhammad. A delegation from Medina, consisting of the representatives of the twelve important clans of Medina, invited Muhammad as a neutral outsider to serve as the chief arbitrator for the entire community. There was fighting in Yathrib (Medina) mainly involving its Arab and Jewish inhabitants for around a hundred years before 620. The recurring slaughters and disagreements over the resulting claims, especially after the battle of Bu’ath, in which all the clans were involved, made it obvious that the tribal conceptions of blood feud and an eye for an eye were no longer workable unless there was one man with authority to adjudicate in disputed cases. The delegation from Medina pledged themselves and their fellow citizens to accept Muhammad into their community and physically protect him as one of their own. The Hijra is the migration of Muhammad and his followers from Mecca to Medina, 320 kilometers (200 miles) north, in 622 CE. Muhammad instructed his followers to emigrate to Medina until nearly all of them left Mecca. According to tradition, the Meccans, alarmed at the departure, plotted to assassinate Muhammad. In June 622, when he was warned of the plot, Muhammad slipped out of Mecca with his companion, Abu Bakr. On the night of his departure, Muhammad’s house was besieged by the appointed men of Quraysh. It is said that when Muhammad emerged from his house, he recited the a verse from the Quran and threw a handful of dust in the direction of the besiegers, which prevented them seeing him. When the Quraysh learned of Muhammad’s escape, they announced a large reward for bringing him back to them, alive or dead, and pursuers scattered in all directions. 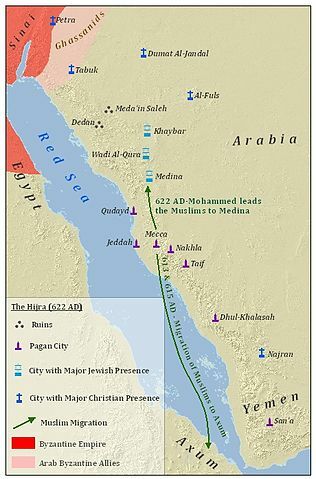 After eight days’ journey, Muhammad entered the outskirts of Medina, but did not enter the city directly. He stopped at a place called Quba, some miles from the main city, and established a mosque there. After a fourteen-days stay at Quba, Muhammad started for Medina, participating in his first Friday prayer on the way, and upon reaching the city was greeted cordially by its people. The Hijra and other early Muslim migrations: The Hijra is the migration or journey of the Islamic prophet Muhammad and his followers from Mecca to Yathrib, which he later renamed Medina, in 622 CE. Among the first things Muhammad did to ease the longstanding grievances among the tribes of Medina was draft a document known as the Constitution of Medina, “establishing a kind of alliance or federation” among the eight Medinan tribes and Muslim emigrants from Mecca. The document specified rights and duties of all citizens and the relationship of the different communities in Medina (including between the Muslim community and other communities, specifically the Jews and other “Peoples of the Book”). The community defined in the Constitution of Medina, Ummah, had a religious outlook, also shaped by practical considerations, and substantially preserved the legal forms of the old Arab tribes. The first group of pagan converts to Islam in Medina were the clans who had not produced great leaders for themselves but had suffered from warlike leaders from other clans. This was followed by the general acceptance of Islam by the pagan population of Medina, with some exceptions. Around 628 CE, the nascent Islamic state was somewhat consolidated when Muhammad left Medina to perform pilgrimage at Mecca. The Quraysh intercepted him en route and made a treaty with the Muslims. Though the terms of the Hudaybiyyah treaty may have been unfavorable to the Muslims of Medina, the Quran declared it a clear victory. Muslim historians suggest that the treaty mobilized the contact between the Meccan pagans and the Muslims of Medina. The treaty demonstrated that the Quraysh recognized Muhammad as their equal and Islam as a rising power. After eight years of warring with Mecca and finally conquering the city in 630 CE, Muhammad united Arabia into a single Islamic state. Muhammad created the first Islamic state when he wrote the Constitution of Medina, a formal agreement between Muhammad and all of the significant tribes and families of Medina, including Muslims, Jews, Christians, and pagans. The Battle of Badr was a key battle in the early days of Islam and a turning point in Muhammad’s struggle with his opponents among the Quraysh in Mecca. The Battle of Uḥud in 625 CE was the second military encounter between the Meccans and the Muslims, but the Muslims suffered defeat and withdrew. After eight years of fighting with the Meccan tribes, Muhammad gathered an army of 10,000 followers and conquered the city of Mecca, destroying the pagan idols in the Kaaba. By the time of Muhammad’s unexpected death in 632 CE, he had united Arabia into a single Muslim religious polity. Constitution of Medina: A formal agreement between Muhammad and all of the significant tribes and families of Medina, including Muslims, Jews, Christians, and pagans, that formed the basis of the first Islamic state. Ummah: The collective community of Islamic peoples. Farewell Pilgrimage: The only Hajj pilgrimage to Mecca by the Islamic prophet Muhammad, in 632 CE. Upon his arrival in Medina, Muhammad unified the tribes by drafting the Constitution of Medina, which was a formal agreement between Muhammad and all of the significant tribes and families of Medina, including Muslims, Jews, Christians, and pagans. This constitution instituted rights and responsibilities and united the different Medina communities into the first Islamic state, the Ummah. An important feature of the Constitution of Medina is the redefinition of ties between Muslims. It set faith relationships above blood ties and emphasized individual responsibility. Tribal identities were still important, and were used to refer to different groups, but the constitution declared that the “main binding tie” for the newly created Ummah was religion. This contrasts with the norms of pre-Islamic Arabia, which was a thoroughly tribal society. This was an important event in the development of the small group of Muslims in Medina to the larger Muslim community and empire. While praying in the Masjid al-Qiblatain in Medina in 624 CE, Muhammad received revelations that he should be facing Mecca rather than Jerusalem during prayer. Muhammad adjusted to the new direction, and his companions praying with him followed his lead, beginning the tradition of facing Mecca during prayer. The Masjid al-Qiblatain, where Muhammad established the new Qibla, or direction of prayer: Muhammad received revelations that he should face Mecca, rather than Jerusalem, in 624 CE. Economically uprooted by their Meccan persecutors and with no available profession, the Muslim migrants turned to raiding Meccan caravans. This response to persecution and effort to provide sustenance for Muslim families initiated armed conflict between the Muslims and the pagan Quraysh of Mecca. Muhammad delivered Quranic verses permitting the Muslims, “those who have been expelled from their homes,” to fight the Meccans in opposition to persecution. The caravan attacks provoked and pressured Mecca by interfering with trade, and allowed the Muslims to acquire wealth, power, and prestige while working toward their ultimate goal of inducing Mecca’s submission to the new faith. In March 624, Muhammad led three hundred warriors in a raid on a Meccan merchant caravan. The Muslims set an ambush for the caravan at Badr, but a Meccan force intervened and the Battle of Badr commenced. Although outnumbered more than three to one, the Muslims won the battle, killing at least forty-five Meccans. Muhammad and his followers saw the victory as confirmation of their faith, and Muhammad said the victory was assisted by an invisible host of angels. The victory strengthened Muhammad’s position in Medina and dispelled earlier doubts among his followers. To maintain economic prosperity, the Meccans needed to restore their prestige after their defeat at Badr. Abu Sufyan, the leader of the ruling Quraysh tribe, gathered an army of 3,000 men and set out for an attack on Medina. Muhammad led his Muslim force to the Meccans to fight the Battle of Uhud on March 23, 625 CE. When the battle seemed close to a decisive Muslim victory, the Muslim archers left their assigned posts to raid the Meccan camp. Meccan war veteran Khalid ibn al-Walid led a surprise attack, which killed many Muslims and injured Muhammad. The Muslims withdrew up the slopes of Uḥud. The Meccans did not pursue the Muslims further, but marched back to Mecca declaring victory. For the Muslims, the battle was a significant setback. According to the Quran, the loss at Uhud was partly a punishment and partly a test for steadfastness. After eight years of fighting with the Meccan tribes, Muhammad gathered an army of 10,000 Muslim converts and marched on the city of Mecca. The attack went largely uncontested and Muhammad took over the city with little bloodshed. Most Meccans converted to Islam. Muhammad declared an amnesty for past offenses, except for ten men and women who had mocked and made fun of him in songs and verses. Some of these people were later pardoned. Muhammad destroyed the pagan idols in the Kaaba and then sent his followers out to destroy all of the remaining pagan temples in Eastern Arabia. Following the conquest of Mecca, Muhammad was alarmed by a military threat from the confederate tribes of Hawazin, who were raising an army twice the size of Muhammad’s. The Banu Hawazin were old enemies of the Meccans. They were joined by the Banu Thaqif, who adopted an anti-Meccan policy due to the decline of the prestige of Meccans. Muhammad defeated the Hawazin and Thaqif tribes in the Battle of Hunayn. At the end of the 10th year after the migration to Medina, Muhammad performed his first truly Islamic pilgrimage, thereby teaching his followers the rules governing the various ceremonies of the annual Great Pilgrimage. In 632, a few months after returning to Medina from the Farewell Pilgrimage, Muhammad fell ill and died. By the time Muhammad died, most of the Arabian Peninsula had converted to Islam, and he had united Arabia into a single Muslim religious polity.